We are super stoked to announce that we will be hosting our first ever BRIDAL FAIR in February! We have invited some of our favorite and most trusted vendors to come out and participate in this event. 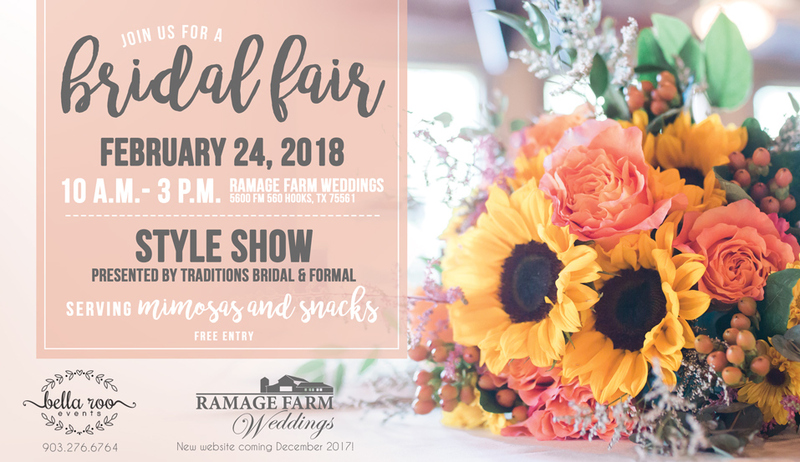 There will be a style show by Traditions Bridal & Formal. Sweet treats will be provided by Annabelle's Southern Sweetness. You do not want to miss this, y'all! Entry is free, so come enjoy a complimentary mimosa and get to planning! Sponsored by yours truly, Bella Roo Events! This entry was posted on Thursday, January 4th, 2018 at 12:22 am	and is filed under Uncategorized. You can follow any responses to this entry through the RSS 2.0 feed. Both comments and pings are currently closed.